How Guest WiFi Works ? When your guests connect to WiFi, a nice splash page with your logo will appear on their device. Guest may select preferred connection method, like social login, access-code login or free access and start using WiFi. Your splash page can be configured in different ways – to show video advertisements, collect email and customer data, social login, to offer free Internet, or even high-speed paid access. Every connection will be recorded and data provided in extensive analytics for better guest understanding and marketing activities. Once logged-in, guest may be redirected to view desired website or promotion page. 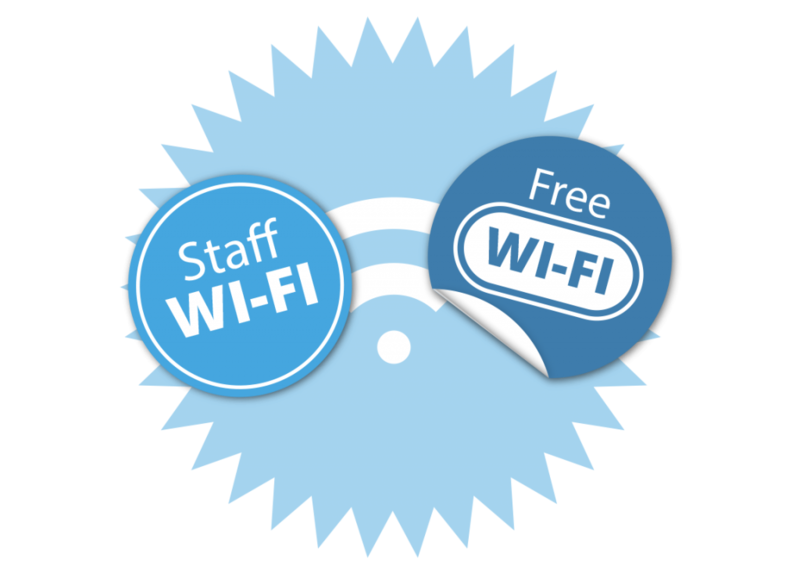 Each connected device is limited with download and upload speed, available bandwidth transfer, time to use your service, so you can ensure excellent WiFi experience for all your guests. How to setup guest WiFi ? If a business already provide “Free WiFi” with a shared password which is told to the guest, it’s time to go next-level. Separating Guest WiFi from business (private) network is the first step. Existing WiFi can be renamed to “Staff WiFi” and secured with a password. If you are using ADSL modem which can not be upgraded, you will add additional router that will serve guests. Additional “Free WiFi” network will be created without a password, so that guests can easily connect without a password. Once connected, they will get a splash page asking them to login, watch video ad, complete satisfaction survey etc. Guests will connect easily and your staff will do their real job instead of telling passwords and helping customers to connect. For large or multiple venues, hotels & resorts, we recommend using more powerful routers (Ligowave, Mikrotik CCR etc) or cloud controlles with access points (Cisco 8540 controller, Ruckus controller etc). Better routers/APs can serve multiple SSIDs, accept more users online, provide better bandwidth performance. Our Guest WiFi system can work with wide variety of devices, from entry-level TP-Link to high-end cloud controllers. Grow your social network and use it to strenghten relationship with your guests. Easy one-time setup, guest Wi-Fi platform works for you 24/7. Start Hotspot WiFi router can be easily configured and installed. It can be added to existing network so you can keep your old WiFi for staff and separate new Social WiFi login for customers.